This appetizer wreath was easy to make ahead. I changed a few things. Their version served 16. Mine will make 28 or more servings. 3/4 cup finely chopped sweet red pepper ~ Reserve enough of the red pepper to create a bow for the wreath. I made the bow first and diced the remaining pepper for the wreath. I’m guessing on the amount of broccoli, celery and diced red pepper. I just diced and sprinkled it on until it looked full enough. Remove crescent dough from packaging, but do not unroll it. Cut each tube into ten [rather than eight] slices. Arrange in a circle on an ungreased 16-in. pizza pan. I lined my pan with parchment paper. Arrange the remaining crescent rolls in a smaller circle just inside the first one. In a small bowl, beat the cream cheese, sour cream, dill, garlic powder, dry onion, Worcestershire sauce and salt until smooth. Spread a little under the wreath to keep it from sliding off the platter. Spread mixture over the wreath; top with broccoli, celery and sweet red pepper. Create a bow with sweet red pepper to garnish the wreath. If I had had some cherry tomatoes handy, I would have dotted some of those on the wreath, as well. This entry was written by ~~Rhonda, posted on December 22, 2009 at 5:37 am, filed under Christmas, Recipes and tagged appetizer wreath, recipe. Bookmark the permalink. Follow any comments here with the RSS feed for this post. Post a comment or leave a trackback: Trackback URL. 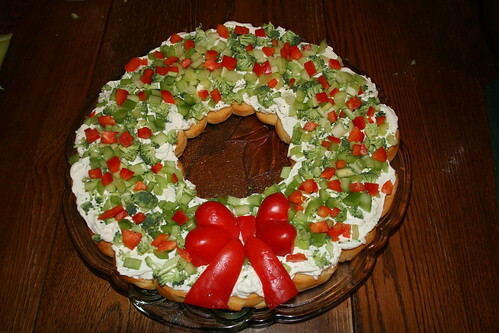 That appetizer wreath makes a great presentation………..i’ll have to give it a try! Wow ! Great looking on the table ! I’m sure it’s a hit. I’ll have a piece please. Looks festive! I’m not sure I understand how to lay out the crescent rolls on the parchment paper?? Nancy, if you look at this wreath (which uses two tubes of dough), it may give you a better picture. and red , and green fruit maybe. unrolled and placed in a circle. ornament on a separate pan. This is so pretty. I definitely will make this. Dad and wife are coming in the 28th. We will be having friends and Jen and hubby and kids. I’ll probably make it then. So it’s really a different shape of a veggie pizza, very creative. I would use veggie dip to make the already easy easier. I am going to give it a try because it looks so cute and yummy. Is there a trick to slicing the dough? I tried this on another recipe and it did not work, it just smooshed the dough down? Thanks! Looks very good and will try this out at Necoles for Christmas , unless you deliver to G.B.Wisc. Just had to share how easy and yummy this was to make. It was a huge hit and I will make again for upcoming parties. Thank you for sharing this with the world. Merry Christmas to all! You said that this is easy to make ahead. How far ahead did you make it, and didn’t the bread part get soggy? Did you wait to assemble it until right before, or did you assemble it and refrigerate it until needed?